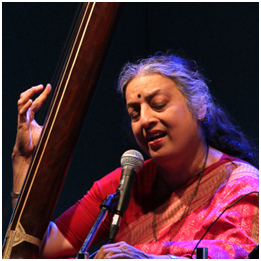 Ashwini Bhide-Deshpande was born in Mumbai on 7th October, 1960, into a family of music connoisseurs and musicians. She completed her Sangeet Visharad from the Akhil Bharatiya Gandharva Mahavidyalaya. Being a scholar, Ashwinitai also obtained a PhD in Biochemistry from the reputed Bhabha Atomic Research Centre, Mumbai. Ashwinitai‘s journey into classical music began under the tutelage of Narayanrao Datar, who belonged to the Paluskar branch of the Gwalior gharana. Later, her disciplined taleem under her mother, Manik Bhide (who herself was trained under the legendary Kishori Amonkar) was largely made up of learning the traditional aspects of the Jaipur-Atrauli style of raga development and also studying the nuances of raga-music. She then went on to train under Ratnakar Pai, a renowned teacher of the gharana, from whom she received further guidance and a great repertoire of the traditional paramparik compositions and ragas. Ashwinitai is a dedicated teacher imparting taleem to the next generation. Some of her disciples include Saniya Patankar, Ravati Kamat, Apoorva Gokhale, Dhanashree Ghaisas, Saili Oak-Kalyanpur, Maitreyee Roy-Dadarkar, Nishad Matange, Vrushali Deshmukh, Swarangi Marathe, among many others. She won the President’s Gold Medal for the AIR Music Competition at the young age of 16. Ashwinitai has been the first woman to have been conferred with the Kumar Gandharva Rashtriya Samman in 2005 by the Government of Madhya Pradesh. She received the Sangeet Ratna Puraskar from Sahyadri Doordarshan in 2010. She received the Sanskritik Puraskar for 2011 from the Government of Maharashtra. She was conferred the Mallikarjun Mansur Award for 2013 from the Bangalore Kidney Foundation. She received the Gaanatapaswini Mogubai Kurdikar Samman for 2014. She is a recipient of the Pandit Jasraj Gaurav Puraskar. The Government of India honoured her with the Sangeet Natak Akademi Award for 2014. Recognized as an ‘A’ grade artist by the All India Radio, Ashwinitai has given performances for both Akashvani and Doordarshan. She has performed all over the nation and abroad. She has published ‘Ragarachananjali’, a book of her self-composed bandishes in 2004. A second book of her works, ‘Ragarachananjali 2’ was published in 2010.